WARNING: Hot lube oil under pressure can cause injury, proceed with care. If possible, allow filter to cool before handling. Shut off engine if possible. If not possible, turn off oil supply shut-off valve located at PSI source on engine. Place a drip pan under the filter to catch any spillage of oil. Open the draincock located at the bottom of filter housing and allow oil to drain. 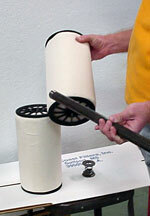 Grasp the round shaped element hold down assembly nut and slowly remove the element assembly from the filter housing. 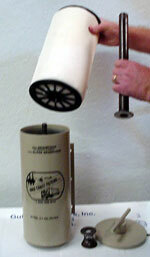 Once the element assembly has been removed from the filter housing, close the draincock at the bottom of the filter to prevent excess oil from draining from the filter housing. Unscrew and remove the element hold down assembly nut. No tools are needed; the nut is installed HAND-TIGHT ONLY. Remove the used GCF element from the GCF housing and set aside. Now replace it with a new GCF Model E-1 element. 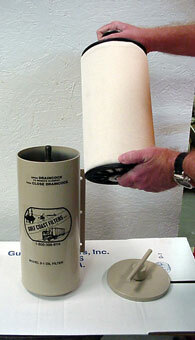 Insure to properly dispose of the used GCF filter element. Reinstall the lid assembly as tight as possible using both hands. DO NOT USE ANY TOOLS OR CHEATER PIPES. Once the filter housing has been serviced, make sure that draincock is closed. Restart engine or Open oil supply shut-off valve and check for oil leaks on the filter housing. NOTE CAREFULLY: If an oil line fails, or an oil leak develops in the GCF Filter (either through failure of part, sabotage, or faulty servicing of the unit), and the engine loses its oil supply, GCF disclaims any responsibility for damage to the engines should it be operated without proper lubrication. Every engine with oil-pressure lubrication has either a pressure gauge or warning light to indicate that oil pressure is not sufficient to lubricate the engine. When this occurs, it is the responsibility of the operator to stop the engine, investigate the problem, and take whatever remedial action is necessary. Gulf Coast Filters, Inc. warrants each GCF Filter to be free from defects in workmanship and materials for the lifetime of the Filter for the original purchaser. During this time, GCF, Inc., will repair or replace any GCF Filter part(s) proven to be defective in either workmanship or materials. The original user must provide receipt of purchase. 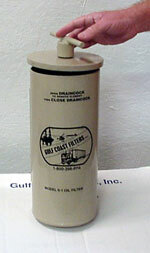 This is the total liability and responsibility of Gulf Coast Filters, Inc.